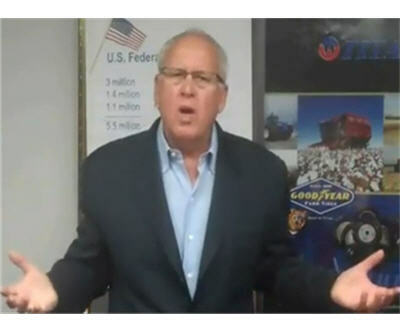 An American tire company CEO blasted French productivity when he explained why his company would not be taking over a Goodyear plant in Amien Nord. In a letter dated Feb. 8 to a government minister, Titan International's Chairman and CEO took the government to task for regulations that would make running the plant—in the CEO's words—"crazy". Maurice Taylor, who also goes by the nickname The Grizz, has served as CEO of Titan since 1990. Taylor ran for President of the United States in 1996 as a Republican promising ". . . to bring sound fiscal management and business know-how to Washington." Titan International is a dealer of tires for both its own brand and Goodyear Farm Tire Brands. Goodyear tried for over four years to save part of the Amiens jobs that are some of the highest paid, but the French unions and French government did nothing but talk. I have visited that factory a couple of times. The French workforce gets paid high wages but works only three hours. They get one hour for breaks and lunch, talk for three, and work for three. I told this to the French union workers to their faces. They told me that's the French way! You are a politician so you don't want to rock the boat. The Chinese are shipping tires into France — really all over Europe — and yet you do nothing. The Chinese government subsidizes all the tire companies. In five years, Michelin won't be able to produce tires in France. France will lose its industrial business because its government is more government. Sir, your letter states you want Titan to start a discussion. How stupid do you think we are? Titan is the one with the money and the talent to produce tires. What does the crazy union have? It has the French government. The French farmer wants cheap tires. He does not care if the tires are from China or India and these governments are subsidizing them. Your government doesn't care either: "We're French!" The US government is not much better than the French. Titan had to pay millions to Washington lawyers to sue the Chinese tire companies because of their subsidizing. Titan won. The government collects the duties. We don't get the duties, the government does. Correction: Previous letter posted had errors due to running through a translation service. The letter has been updated using the original English letter from Taylor.